Our Especial Trip to The Colca Canyon combines wildlife and wonderful natural landscapes. Don’t miss out on this 3 days adventure one of the deepest Canyons on Earth. Day 1°: Bus trip to the Colca Canyon – Overnight at the Colca Valley. 07:30 h. Our guide will pick you up from your hotel in Arequipa. Afterward, we board a private vehicle and start our trip. On route, we will stop at Pampas Cañahuas (3500 m), a natural reserve where visitors may spot Vicuñas. Unlike the llamas or Alpacas, Vicuñas are wild animals, and you can still see them running freely. Following an ascending road, we will arrive at the zone of Viscachani, where we stop to stretch our legs. At this spot, we will get off the bus to observe at the distance the volcanoes of Arequipa. Among them, we can see the volcanoes Ubinas, Misti, Chachani, Sabancaya (active) and Ampato. Later on, we will drive downhill to towards Chivay, the main village of the Colca Canyon. In Chivay, we will have lunch at a local restaurant. After lunch, we drive to the Colca Lodge hotel, which is located near the town of Yanque. This beautiful lodge was built right on the bank of the river, surrounded by ancient agricultural terraces from pre-Columbian times. Its architecture is inspired by the ancient buildings made centuries ago by the first settlers of the Colca. Unlike other hotels, the Colca Lodge offers spectacular thermal pools with privileged views of the river. Our clients can use the thermal pools and relax after visiting the attractions of the Colca Valley. The thermal waters come from natural springs and it contains medicinal properties. At night, we will enjoy a delicious dinner under the lights of a beautiful rustic building. Overnight at the Colca Lodge ***. Day 2°: Early visit to the Cruz del Condor – Overnight at the Colca Valley. 06:00 h. We leave the hotel early in the morning, shortly after breakfast. Today we will visit the popular lookout point called Cruz del Condor. The bus ride to the Cruz del Condor takes 2 hours. Likewise, the road offers great views of the Colca River and the surrounding mountains. We will make some stops along the way for photos. After a short time will reach the zone known as Cruz del Condor. The reason we visit this lookout point so early is that at the site one can see Condors soaring the sky. The condors usually fly over the zone during the morning, so it will be easy to spot them around here. In addition, you will have time to walk along the edge of the canyon and take great photos. Eventually, we will return to the village of Chivay, passing through typical villages on route. Lunch at the Colca Lodge restaurant. In the afternoon, you can visit the Alpaca Ranch where we can see beautiful specimens of different colors and learn about them. Likewise, you can also visit the Cóndor room, a good place to learn about the Andean birds that inhabit the Colca valley. You might end your day by the thermal pools or walking around the lodge in search of good photos. Day 3°: Bus ride to the city of Puno. 11:30 h. Our driver will pick you up from the Colca Lodge hotel and then transfer you to the village of Chivay. Before taking the bus to Puno, we will have lunch at a local restaurant in Chivay. 13:30 h. We will board the bus to Puno. The trip to Puno lasts around 6 hours. 19:30 h. Arrival in the city of Puno. Our Especial Trip to The Colca Canyon is subject to availability. For a quick reply, kindly contact us via WhatsApp. Click on the following number to contact us at +51 956691155. 07:30 h. Pick up from your hotel in Arequipa. Private transportation to the Colca Canyon. Entrance fees to the Colca Canyon National Park. Lunch at the village of Chivay. Dinner at the Colca Lodge hotel. 06:00 h. Guided visit to the Cruz del Condor lookout Point. 12:30 h. at the Colca Lodge hotel. 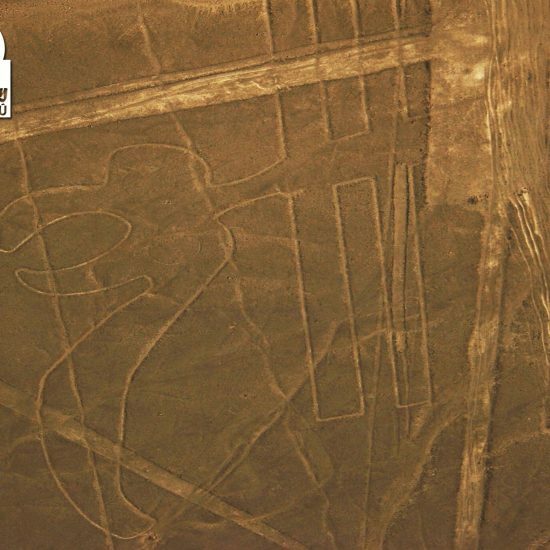 11:30 h. Pick up from the hotel and transfer to Chivay. 12:00 h. Lunch at the village of Chivay. 13:30 h. Tourist bus to the city of Puno. 19:30 h. Arrival at the bus terminal of Puno. End of our service. Especial Trip to The Colca Canyon. We are delighted you are thinking about joining one of our tours. The fastest way to check if the tour you wish in Peru is available is contacting us via WhatsApp, or calling us to our main office in Lima to the following number +51-1-4350051. You might also send us an e-mail to [email protected], and we will reply within the next 24 hours. If you already contacted us, and the tour you wish is available, then you may proceed with your payment. We accept the following credit cards VISA, MASTERCARD, AMERICAN EXPRESS, and DINER CLUB. We do not charge any commission or surcharge for using the online payment system. 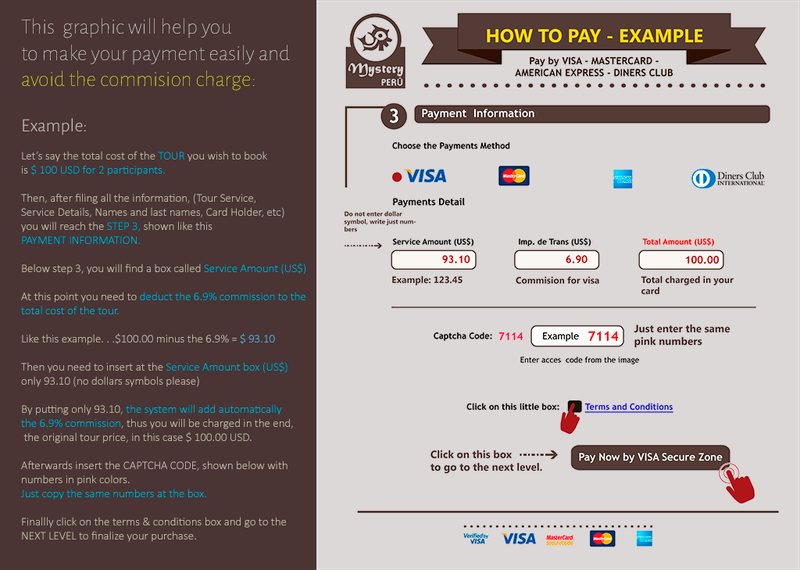 At the following link, you will find a good graphic that will help you to make your payment and avoid the commision charges on your credit card. Click here. You can proceed with your payment at the following link…..Click here. 2°: Payments via PAY PAL. You can safely make your payment via PAY PAL entering to the following link….Click here. You can safely make an international wire transfer. Payment is due upon confirmation of tour date. The amount must include all wire fees. Once you had made your deposit, please kindly scan the bank transfer receipt and send it to us as an attachment by e-mail. Another good option to make your booking is using WESTERN UNION. Telephone: 0051 + 1 + 4350051. To help us process your inquiry as efficiently as possible please send us via e-mail the following information. You will receive an electronic voucher via e-mail once your payment is confirmed. For every confirmed booking you will be required to print your electronic voucher for presentation at the moment we start the excursion. The electronic voucher acts as a confirmation for all the services you requested. We will send you complete operator information, including phone numbers at your destination. Our Managers select only the most experienced and reliable operators in each destination, removing the guesswork for you, and ensuring your peace of mind.